One of the newest methods in restorative dentistry for replacing lost teeth, dental implants are a permanent way to have a strong, long-lasting smile. Titanium screws are first placed in your jaw by an oral surgeon. Then, Dr. Amico or Dr. Mauck will create custom-made, tooth-like crowns for you that will sit on top of the screws, which will hold them firmly in place. Dental implants have an advantage that few procedures do: they provide you with new tooth roots, meaning your jaw stays healthy and functional through the years. With our E4D technology, we can now craft porcelain crowns in just one visit, saving you valuable time. E4D takes digital impressions of your teeth then sends this information to a computerized milling unit that works on your new crown while you wait. After only around an hour, you’ll be ready to head out in the world with new confidence and a new, complete look. 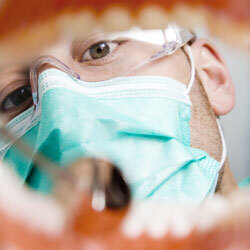 If you’re in need of restorative dentistry, don’t let the time get away from you. Let Dr. D’Amico, Dr. Mauck, and their team help you keep smiling! Call our office in Aurora today with any questions you might have about our restorative dentistry procedures, or if you’re ready to schedule a consultation. Our office serves patients from the greater Denver area as well, including Centennial, Englewood, and Parker.